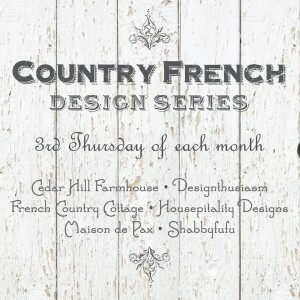 I am joining a new event today called Country French Design Series. This is my kind of thing! 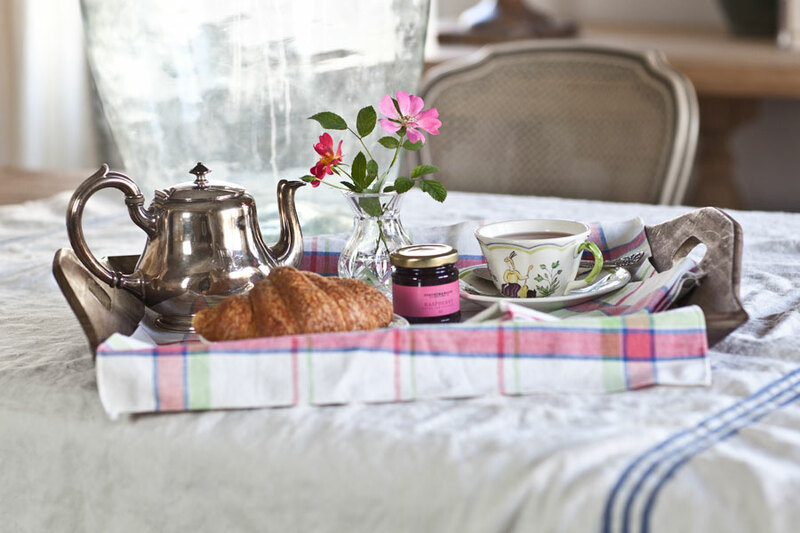 Today’s theme is a country French morning, so I thought I would share a bit of my morning with you. First things first. I make a pot of hot tea. I start with well water we bring back from the farm. No chlorine taste and all of the minerals give it a nice flavor. I fill my tea kettle up all the way. My old tea kettle just sprung a leak so I decided I needed a cute one. I shopped on Amazon and found this sweet number (affiliate link). I like that it is ceramic. I know a lot of people heat their water in a microwave, but not me. It doesn’t taste very good that way. Don’t believe me? Then do a taste test like I did. I always have my tea in a pretty teacup with a silver tea spoon every morning. It is one of my favorite parts of the day. I also have a smoothie most mornings, but for today it’s a croissant, since that is a very French breakfast. 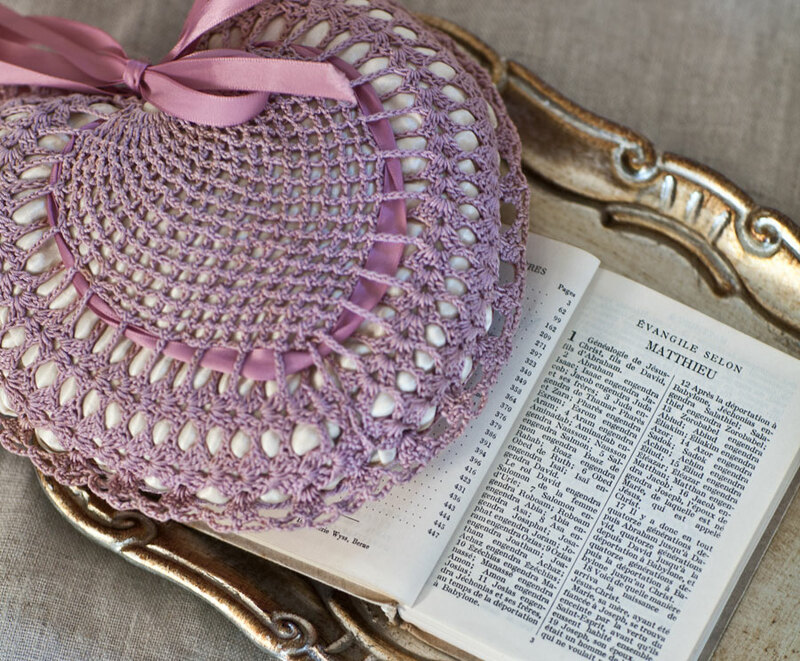 This sweet little plaid napkin is from France. 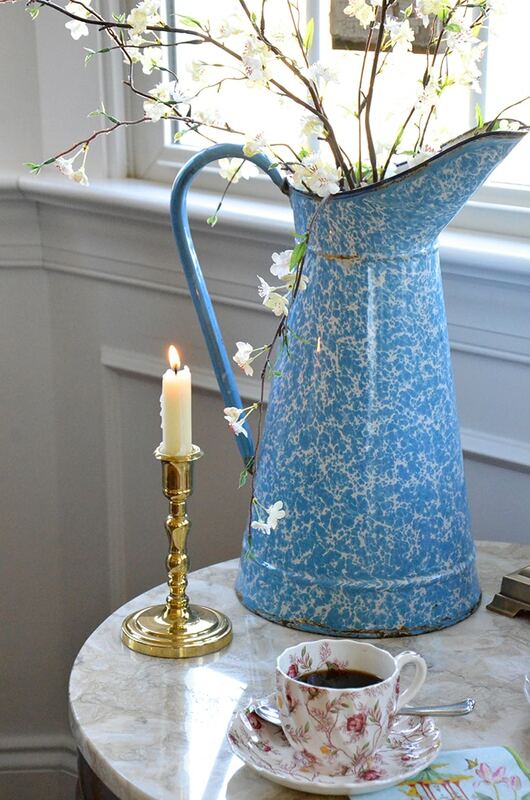 The silver-plate teapot is one I found at the flea market in Paris. It’s a monogrammed Christofle. 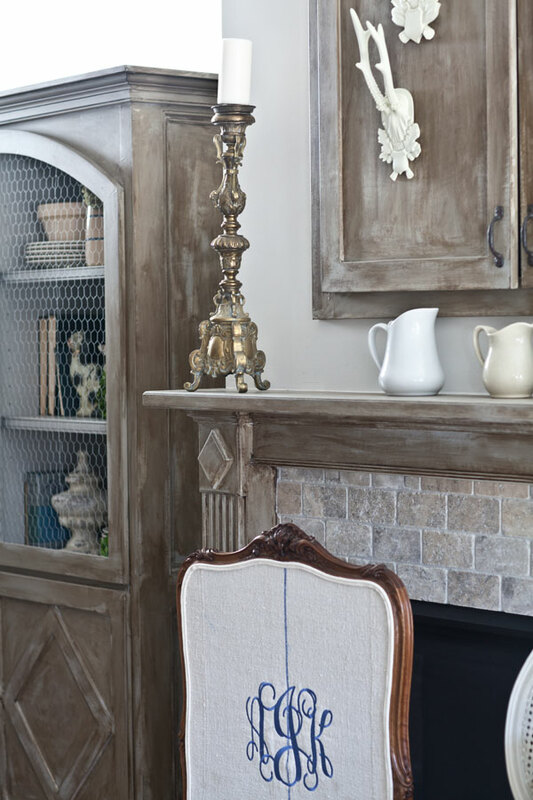 Simple yet elegance, it embodies restrained French style. I bought several tins of tea while in Paris last time. It’s delicious! 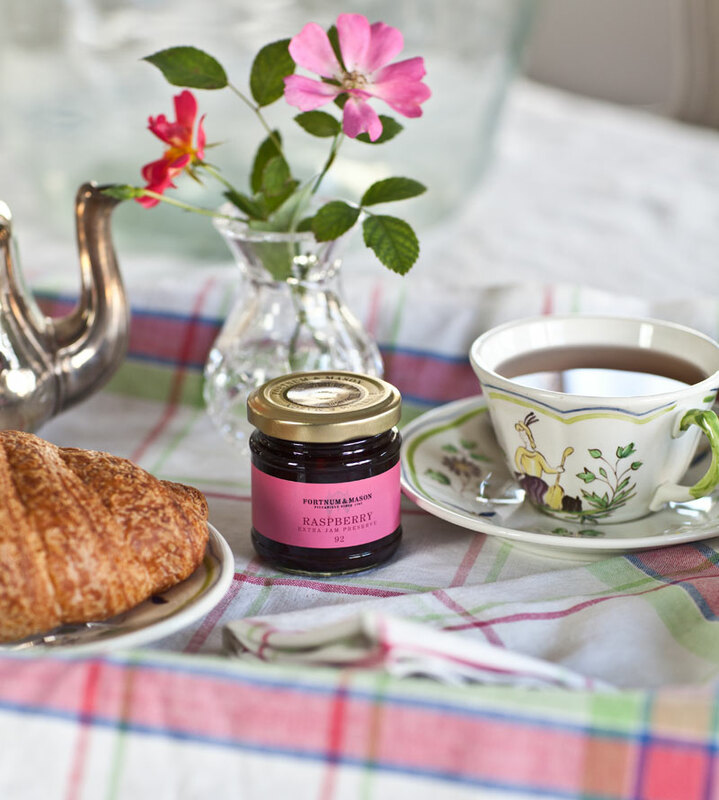 Mariage Freres is a gourmet French Tea or The company. 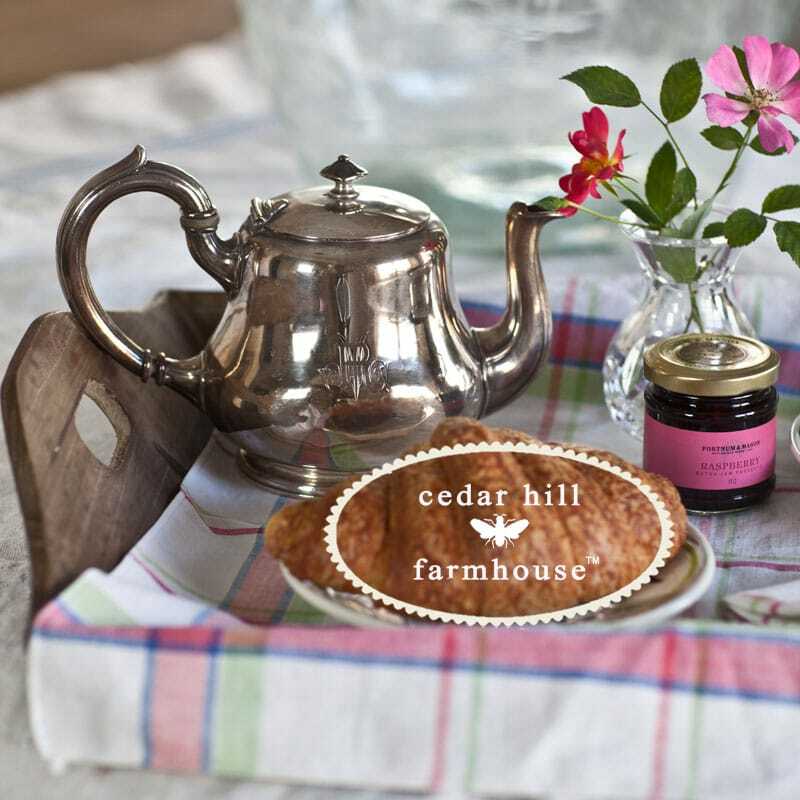 Founded in 1854, their teas are simply delicious. My favorite green is the (affiliate link) The Vert Marco Polo. (Affiliate link) Bolero is one of my favorite black teas made by Mariage Freres. Mostly I’m gluten free, but sometimes as a special treat I have a croissant from the local bakery that is walking distance from my house. After breakfast if I had time I would love to do a bit of reading. 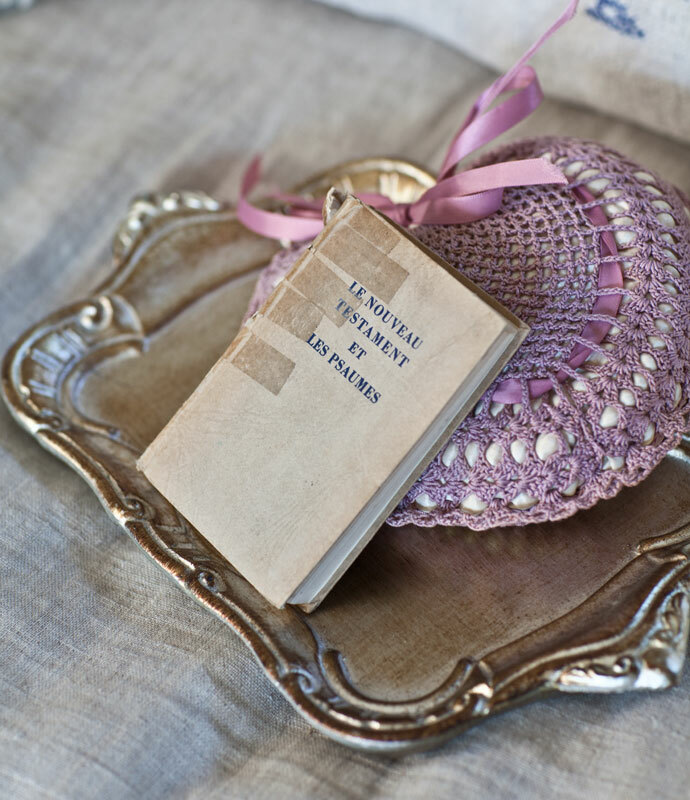 I wanted you to see one of the few French books in our home, a French New Testament. It was printed in 1946 (if I remember correctly) in Geneva. It belonged to my father-in-law and I believe it bought it when they lived in Geneva after he finished his Ph D.
A Kindle is nice, but I do love the feel of a book in my hand. After breakfast I usually sit on the sofa and catch up on things before I get dressed. It’s a bad habit I think to start working before I’m dressed but I do it every day. I used to work on the computer in my study, but I finally got a pretty fast laptop last year and now I work in here on the sofa. The cabinets are not blocking windows. The windows are short situated above the cabinets. I only mention that because people ask me all the time why I am blocking the windows. There is no point to put in a big window here, because all you can see through those windows is the side of the neighbor’s house just a few feet away. And this is where I am many mornings. I usually do photography and styling in the afternoon, and a few days a week I pack up goodies for my online shop. Some days I have meetings, but most of my meetings aren’t in person; they are phone appointments, so they usually happen in here. So that’s my morning. 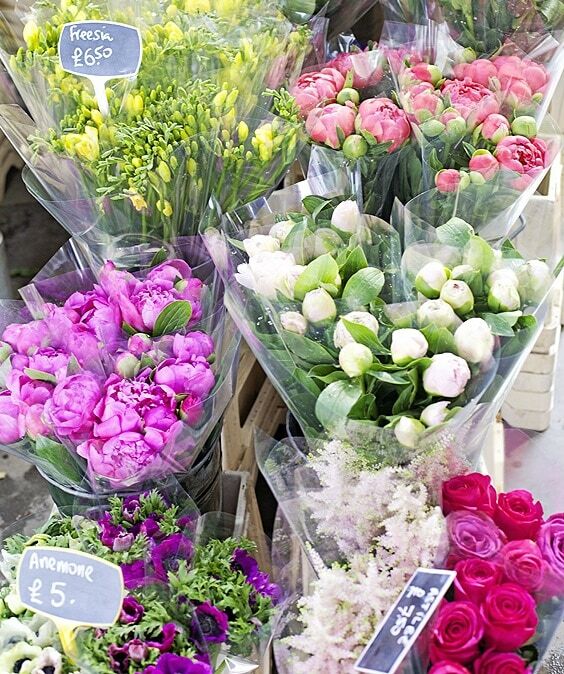 I do love the French touches that make my ordinary life feel extraordinary. If you are in Houston, I have a DIY painting workshop this Saturday. It’s not too late to sign up!! 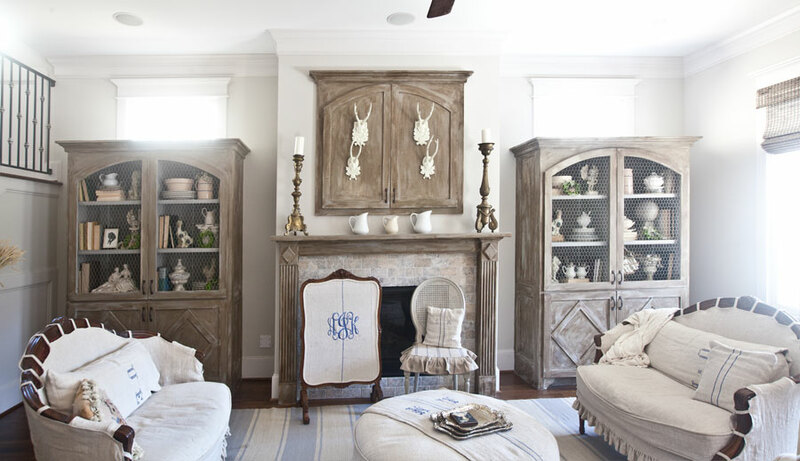 I can just imagine how wonderful it is to begin your day in that beautiful room surrounded by extraordinary beautiful things that warms your heart. I miss the amazing French croissants. I am going to have to order that tea as I just ran out of the Kusmi tea that I bought in France and would love to try the Marige Freres…Have a great day! What a charming, beautiful morning…lovely, Anita! Loved sharing your French inspired morning with you Anita! I am going to have to try that tea, and love the tea pot! Ha ha, Anita, I too work all morning before getting dressed and your room already has beautiful light! 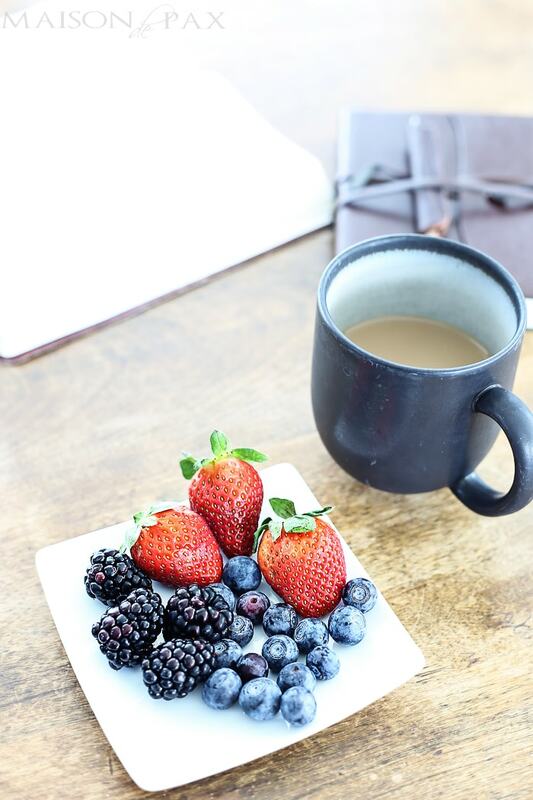 I’d much rather have your lovely cabinets… 🙂 Wonderful breakfast tray, as well!! 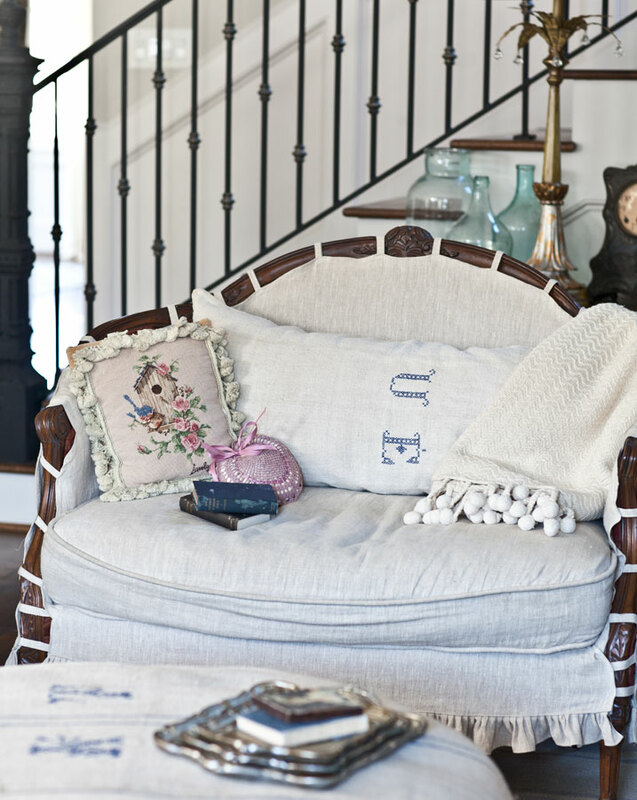 You have a beautiful room to start your French Country Morning! What an elegant place to work, dear friend! And, a bonus that it is your home! I, too, am a paper, pencil person with reading and writing. 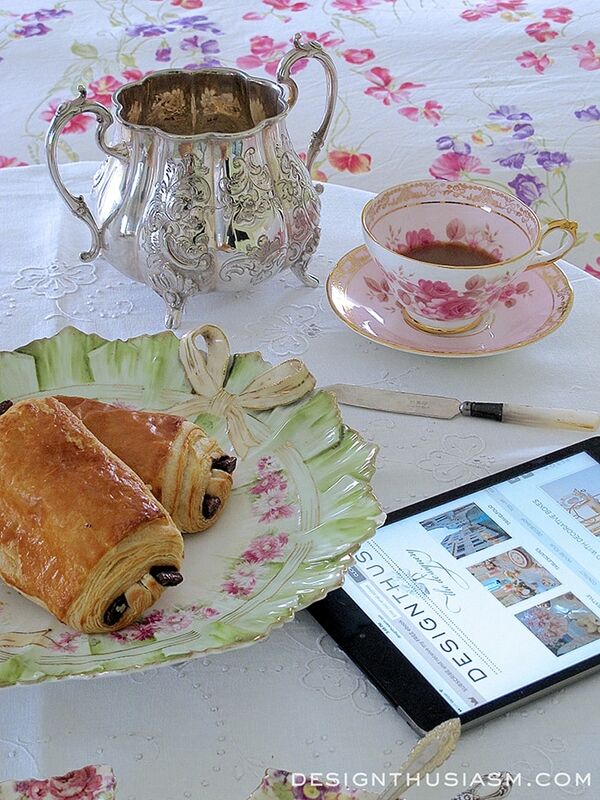 Thanks for sharing this new “series” beginning with A Very French Morning! Very pretty Anita. What a great “office” you have. Tea does taste better from a real teapot doesn’t it? Lovely setting. I love this new series! 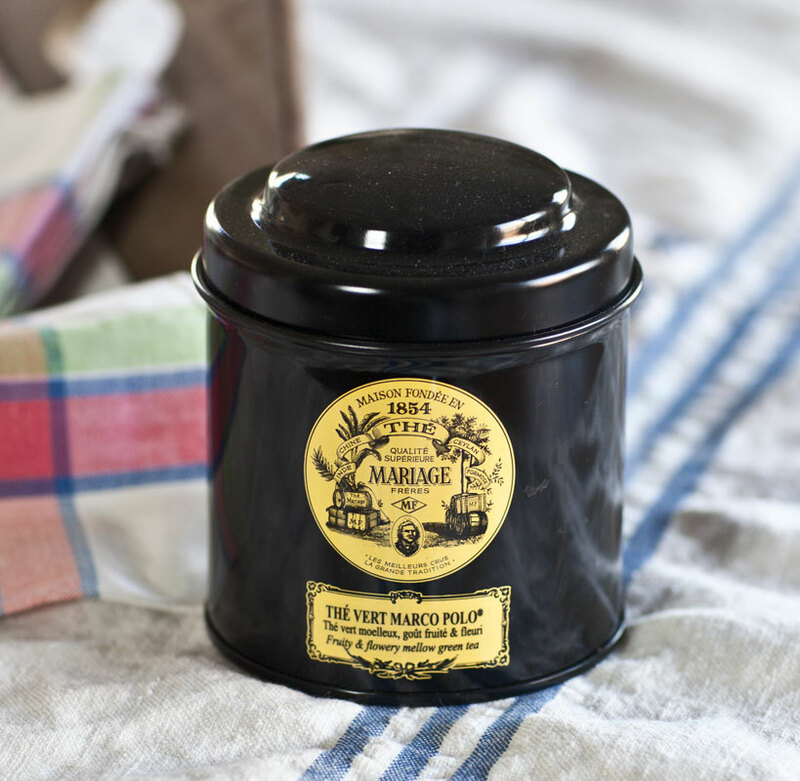 I also love mariage freres tea! My favorite flavors are earl grey d’or and espirit de noel. I’ll have to give your faves a try too! Oh yum, looks like I need to try your facs Angelina. I’m hostessing a couple’s wedding shower out of town this Saturday, or I would be at your painting workshop! Please offer it another Saturday. Always so lovely Anita! 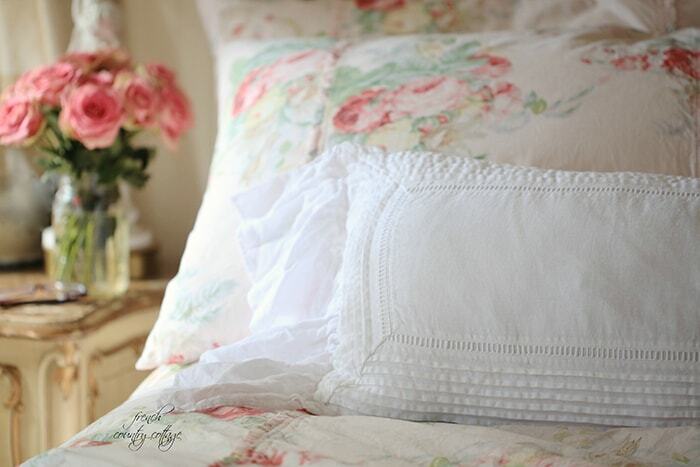 It’s funny but I saved a Mariage Freres label some years back and reproduced it to make a couple of pillows out of because I liked the graphic! I didn’t read your post until afternoon, but it’s still very refreshing and inspiring. You definitely re-energized me. Have fun on Saturday! I enjoyed visiting with you so much. It was so warm and relaxing. Thank you for sharing, good kind friend. Mariage Freres are my favorite teas, especially Marco Polo, and their Earl Grey is the absolute very best Earl Grey. Having had the experiencing of taking tea in two of their establishments in Paris, I can testify that the French do know how to do tea! I, too, relish memories of enjoying a light breakfast at one of the lovely Parisian sidewalk cafes watching all the interesting people walk by as I sip my morning tea and savor a delicious buttery croissant. Feels like I had a breakfast tea with you, Anita. 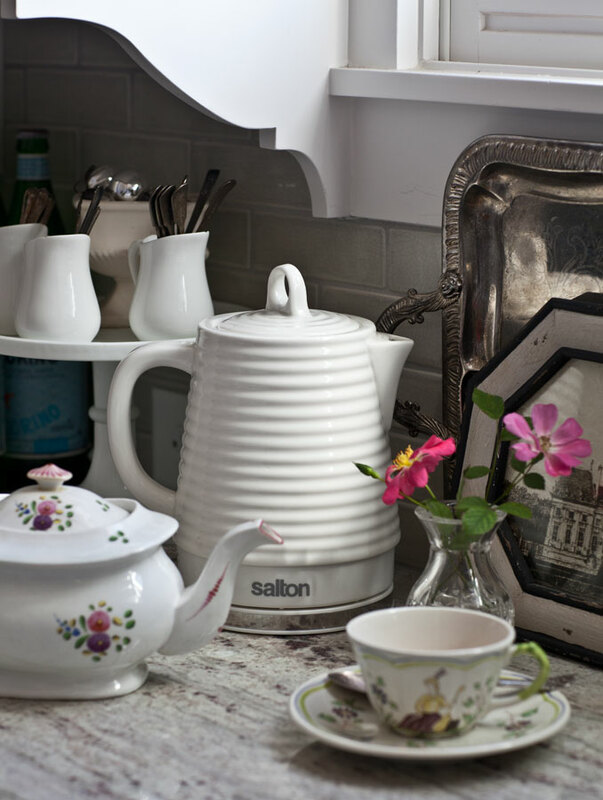 Love the teapot you chose and like you, I enjoy my tea in a pretty China cup. Starts my day with things I love and happy thoughts. I love this post and your plans for the new series! And, I do love your blog and have so much enjoyed your lovely book. Thanks, for all you do to brighten our days! I love everything Tea related. The Rose chintz Tea cup is beautiful! Do you know the name of the tall three tier thing that is put on the table as a server during high tea? I’ve asked so many people and nobody knows the official name. I think it is called a 3 tiered tray or cake stand. Not sure there is a more fancy name for them. All I know is that I love the goodies served on the stands. I also like to have cocoa like this in one of my lovely teacups that I have collected through the years. I had no idea that there was a difference in the taste of water being heated in the microwave and water heated in a ceramic teapot. Thanks for the tip. I really like your new teapot. It’s so feminine looking. Can’t believe it’s been 20 years since I was last in Marais locating Mariage Freres. Still can remember the aroma of all the teas combined. Bought 3 or 4 different ones, figuring they’d think I was either crazy or barbaric to ask for a blend of everything to match that scent. Thanks for the daydream! I’m in love with this new series already! ??? What a truly lovely post, Anita. I found myself sighing out loud several times, sipping my own tea and enjoying this read very much.